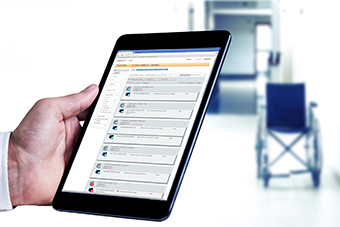 RadiNET Pro enables unified QC management of multiple monitors used in Picture, Archive and Communications Systems (PACS), Hospital Information Systems (HIS) and Radiology Information Management Systems (RIS) in a hospital. As well as reducing the workload of monitor administrators and maintenance service managers, this dramatically cuts monitor quality support and maintenance costs. 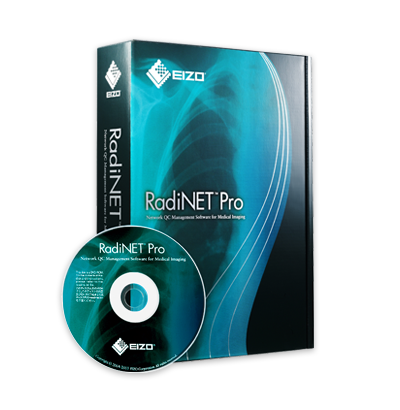 RadiNET Pro enables centralized management of all the client PC monitors with RadiCS software installed via an intra-hospital network. Up to 8,000 monochrome or color monitors connected to 1,000 client PCs covering everything from QC history reference to setting changes. When there is a change in the monitor's quality condition, it will show up on "Monitor Status" section. An alert message can also be sent automatically to the administrator's specified mail address to enable immediate maintenance. This simple web-based application offers easy access to desired information. The administrator may conduct monitor QC operations from anywhere in the hospital smoothly and promptly. The user interface incorporates a tree view which makes it easy to visually capture the structure of all controlling monitors. It also supports various resolutions which increase the flexibility of the layout. 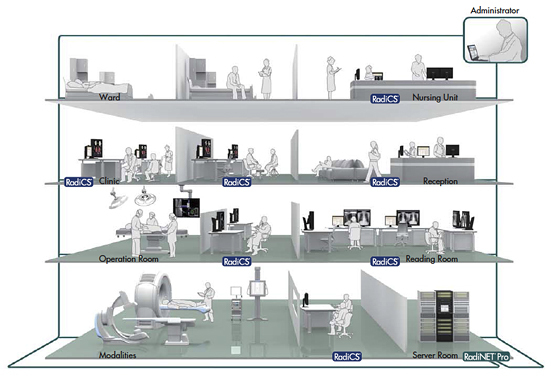 QC tasks such as testing and calibration using the Integrated Front Sensor or swing sensor can be performed remotely. This dramatically reduces the time and effort of the users and administrators required for calibration of the monitors.